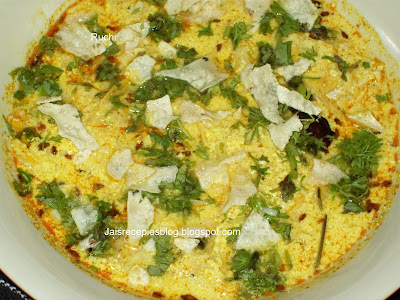 If you are fond of Papad you will love this dish! The mildly tangy flavor of the curry goes really well with plain boiled riceand It tastes superb with jeera(cumin) rice.. Papad Ki Sabzi from Rajasthan in western India, is a great dish for when you're in a hurry but want a hot, cooked meal!. Papads ki sabji are prepared with besan(chickpea flour) and spices. Here we are soaking the papads in gravy and making an excellent curry. Get the extraordinary taste of Rajasthan cuisine with papad. 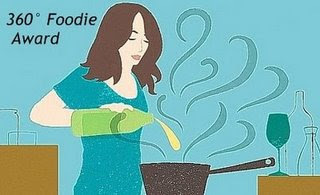 Heat the oil, fry the papad and keep aside. In a wok, heat the ghee and sauté the cumin seeds. Add ginger-garlic paste and stir till light brown. To this masala, add chopped green chilli and ginger, cook for 2 mins. Pour the curd in the masala and stir. Add water and bring the gravy to a boil, letting it thicken. Break the fried papad into small pieces and put them in the gravy. Add salt and let it cook for 3-4 mins. Garnish and serve hot. this recipe is very good, simple and fast to cook. I am so happy there was raining of awards .Some of my friends have been kind enough to pass me a few more awards. I am so happy and excited about these new awards. 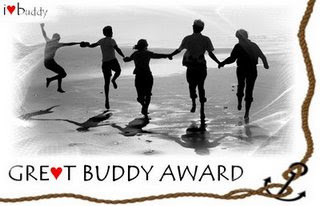 Yasmeen ,Priya, Gita has passed me Kreativ blogger and Great Buddy awards Thank you so much Yasmeen,Priya & Gita. Vidas passed me 360 foodie award this award, thank you so much, it means a lot to me. I am passing on this award to all my blogger friends who have been encouraging me and have passed on their valuable comments. All of you deserve these awards even some of you may already have received these awards. Special thanks to each and everyone of u who encouraged me with wonderful awards! Thanks you Friends this means a lot to me. Congrats on ur award! This recipe looks delicious. Thank you all for your wishes & for encouraging comments. tried it! it was great! thanks!